I have cottonwood leaves all over my garden and we've had some deliciously cool nights, so fall is definitely in the air. (We'll just ignore the fact that it's 95°F and super humid today.) I do an awful lot of transplanting in fall and am looking forward to the busy 6-8 weeks ahead of me! It's been so hot this summer that I haven't been in the garden nearly as much as normal. 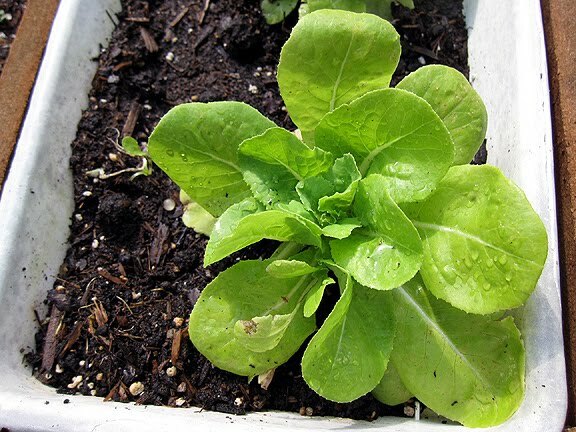 The beginning of September also means it's time for the monthly SeedGROW post. I'm really liking the 'Summer Splash' marigolds. The photo on the seed packet shows them as a solid lemon yellow, but in all honesty, I prefer this color. The plants are super bushy and nearly 2 feet tall, and I only watered them regularly after I first planted them. 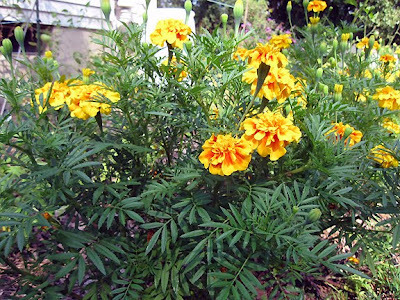 I really like them along the edge of my veggie bed, and they have helped me fall in love with marigolds again. My basil 'Italian Cameo' did absolutely marvelously, considering how often I forgot to water it--and it was in a container! 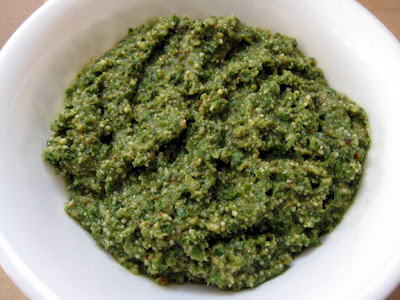 I harvested it to make pesto (using this recipe, only I roasted the pine nuts first and added twice the amount of garlic they listed), so it now looks like this. If you would like to see the actual plant and its beautiful leaves, go here. I hadn't thinned out my lettuce 'Garden Babies' and it was growing too closely together. It's doing much better now with more room. I'm growing with the SeedGROW project. Thanks to Renee's Garden for the seeds. And there it is - the pesto! 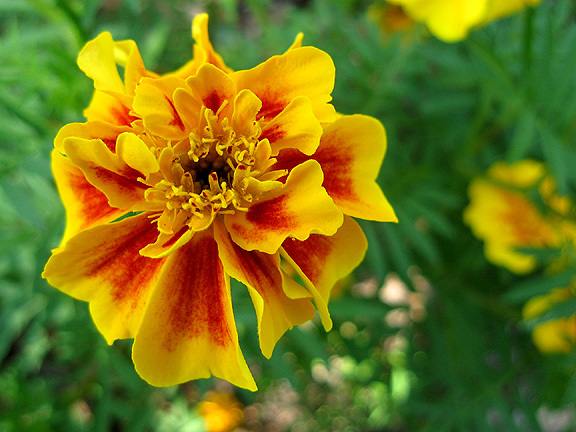 Marigolds are one of my all-time favs. I love that it reseeds so easily. It pretty much plants itself every year...now, if I could just teach them to weed too...Mmmmm, pesto! I make mine with walnuts instead of pine nuts...very tasty. I could have written your first paragraph. UGH.. This has been a summer to remember the next time there is a little heat spell. You can say to yourself that it was nothing like summer 2011. UGH... The marigolds look great. That pesto looks yummy too. You have been busy. I love that you count on marigolds for some splashy color this time of year. Your pesto looks yummy--my basil is looking pretty puny right now. Did you keep deadheading yours? I let mine flower and keep wondering if it would have done better if I'd pinched those flowerheads off. I am sooo ready for fall,too--we're on our third day in the high 90's, and other than early morning watering, the garden is on its own while I stay inside! My marigolds were hopeless this year due to the cool wet conditions. Love pesto....so much nicer when you have your own basil to harvest. Maybe I'll get pics for a followup post in October when I go back. I LOVE those tagetes. If only we could get seed for such big, bold, leafy plants here in the UK. Most varieties sold here are either horribly compacted cramped-looking things, or big fat African marigolds with flowers that resemble orange or yellow powder puffs. Horrible! I envy your hot weather. Summer here in England has been like western economic growth - weak, slow, hesitant and ultimately unsuccessful. Current cold rain puts me at my computer instead of where I should be - out in September sun, transplanting perennials. Did anyone say Hey Pesto! Monica - finally got around to your blog - it's great! So much subject matter covered so comfortably and accessibly; well done! I've been trying to blog on average once a week but hit a snag in the Spring when a couple of my feline companions left the fold. Doing better now and blogging a lot on natives - and loving it! Keep up the good work! Those marigolds are so cute Monica! We had a speaker on "Preserving the Harvest" at a recent garden club meeting. She had lots of frugal tips, including using almonds instead of pine nuts. It was really delicious. Your marigolds did absolutely beautiful! I am going to make some pesto this weekend because you've inspired me.